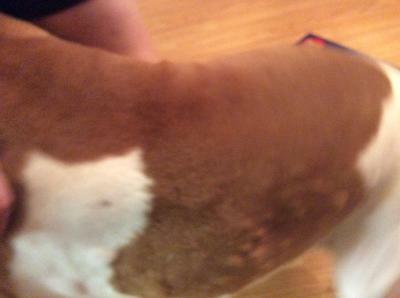 Reader Question: What could these dog skin lumps be? I squeezed them and nothing came out. He has had them for about a week. Could they be related to my dog spending more time outdoors? 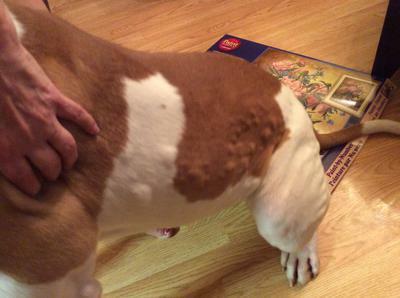 While it’s impossible to diagnose your dog without first having the chance to examine him, the lesions on your dog’s skin could be hives. Consult with your veterinarian if they persist. Hives are usually caused by an allergic reaction to something like an insect or spider bite, allergens absorbed through the skin (like pollen), or a food ingredient. It’s often hard to identify the trigger unless hives become a recurring problem. It certainly doesn’t do any harm to bathe a dog with hives in cool water using a gentle soap to remove any allergens from the coat and skin. Potential triggers in the environment, like perfumes, cleaning solutions, etc., should be eliminated. Washing bedding in a hypoallergenic laundry detergent can’t hurt either. Veterinarians will sometimes recommend diphenhydramine (Benadryl) or stronger medications to suppress the immune system in severe cases of hives. Join in and write your own page! It's easy to do. How? Simply click here to return to Skin Lumps.